It rained during the night and was still pouring down when I got up, so any idea of a bike ride or day on the beach was soon quashed. Being it was Sunday, breakfast had to be a good old English fry-up! Luckily I only had to venture out to collect the green plastic mat by the electric step - something we found on another Aire under our van and now part of the team for this holiday (we have our own in our box room full of campervan stuff). 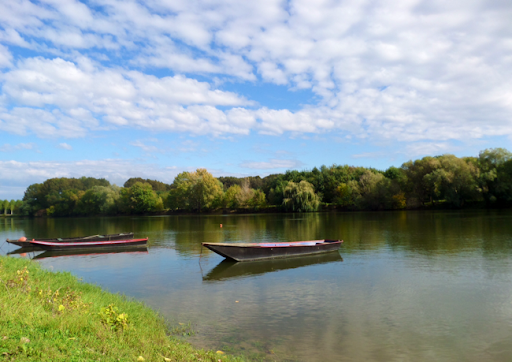 We decided to leave the coast given the weather and head inland to the Loire valley. We started up, drove to the exit where Cathy punched in the code to drop the road barrier and we headed off. 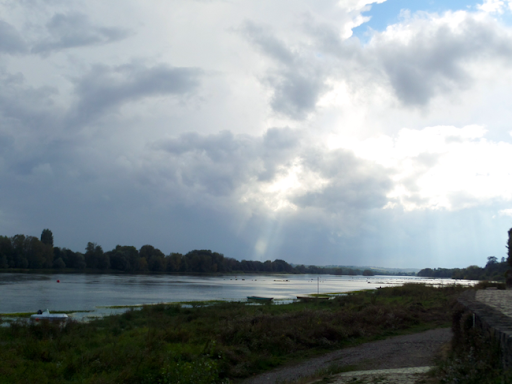 I'd already found a nice looking Aire right on the Loire river and only about 2.5 hours away. It was very wet and windy but our satnav kept us in the right direction. We've changed the voice to French - that is, proper French, not English in a French accent. It's really helping us learn numbers and directions. We may keep her on when back in the UK - it'll be fun to hear how she pronounces English street names! About an hour in we saw a sign for a McDonald's in the direction of St Nazaire - not that we wanted to eat anything from there, but they offer free wifi. So on arrival we parked outside, I connected up the iBoost and we were back on the internet. We only really wanted to do a couple of things - post our Myrtle Mission photo and upload these posts to the blog. As for the likes of Faceache and other social media, I think it's fair to say we'd missed nothing and won't bother checking it again. We also used the opportunity to get the kettle on. With loads of photos, I only managed to upload 7 posts before we wanted to move on. By now the rain had stopped and wind eased, so the remainder of our journey was much easier. 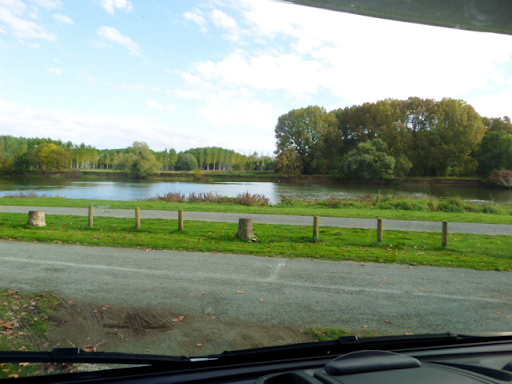 We started to notice the vineyards and Cave signs of the Loire region and was soon pulling in to an almost empty Aire in the village of Bouchemaine; it has space for 50 vans and only 6 were using it. 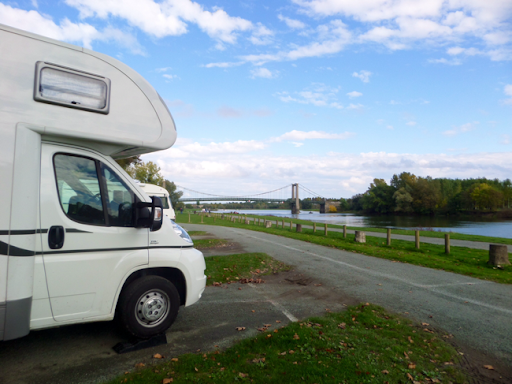 We picked a pitch overlooking the Loire - only 25m from our front wheels - and went for a walk. The sun was lovely and hot but on our return a storm was brewing and the heavens opened as we ran the last bit back to the van. Dried off and ready for a wet, I noticed everyone was hooked up to electric and realised this came free with this Aire. 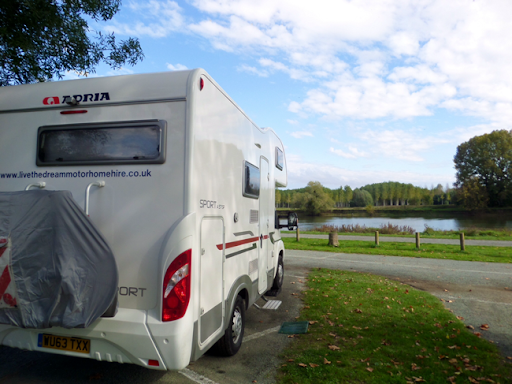 Our current pitch was too far away from the EHU point, so we moved to it, levelled up and hooked up. We also discovered free wifi, but the signal from the van was too weak and even the iBoost failed to connect up - oh well, it doesn't appear we've missed anything on the interweb! We had a bite to eat and once the weather had settled went for a walk into the village. Like most French villages, it had a boulangerie, small shop and a small bar/tabac and one our two Auberges. We walked along the river, under the TGV railway bridge and watched a fishing match on the other bank before turning around and walking back to the Aire. Cathy had a good clean out, including fresh bedding and we dug out Oska to cook dinner - saucisse du porc, haricots du tomate, sauté ognions et tabbouleh - or sausages, baked beans, fried onions and couscous! Oska did us proud and we washed it down with some organic Bretagne cider. The rain came and went, but the wind came and stayed, so with beans & onions, it'll be windy inside and outside the van tonight! 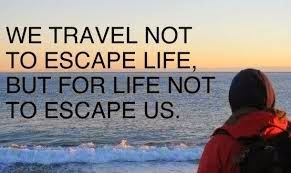 Our plan tomorrow is to explore the medieval town of Saumur, then drop down to an Aire just outside the walled medieval town of Richelieu, perhaps have dinner there tomorrow night. As we're in white wine country we may need to do some quality control - hic!! Clouds are building - we didn't beat the rain back to the van!